Pooja Verma, owner of Pooja Salon always wanted to open her own salon. She attended cosmetology school in New York and worked in several Upscale Salons perfecting her craft. In 2004, she opened a salon in Levittown. The Pooja Salon offers an array of services including Waxing, Facials, Haircuts, Hair Coloring as well as Henna Tattoos. While Pooja and her staff are expert in all these areas, they are probably most well-known for their mastery in Threading. Eyebrow Threading is considered both an art and a skill and alternative for the removal of Facial hairs, it utilizes thin thread which are rolled over the unwanted hair in a twisting motion removing it at the follicle. It can eliminate the unwanted hair for upto 3 weeks leaving behind a straight line, a beautiful arch and a smooth skin. “IT IS AMAZING HOW POOJA CAN GIVE MY BROWS IDENTICAL SHAPING WITH JUST THREAD”,says one of Pooja Salon’s many regular customer. The professional staff at Pooja Salon provides threading for Eyebrow, Upperlip, Lowerlip, Chin, Forehead, Sides & Full Face. Waxing service include Full arms, Half arms,Full Legs , Half Legs, Full front wax, Full back wax, under arms, bikini lines. Pooja Salon is also the perfect place to treat oneself to Facial. Options include Deep Cleansing, Shanaz Herbal Facial, Fruit Facial, Aroma Facial, Acne Facial, 24K Gold Facial, Thermoherb Facial, Face Bleach. The Talented stylists and colorists also deliver beautiful results in hair care.Whether it’s a simple haircut or a blowout, highlights, a touch up or a full-color treatment,the Pooja Salon provides excellent service, quality products and an inviting ambiance. 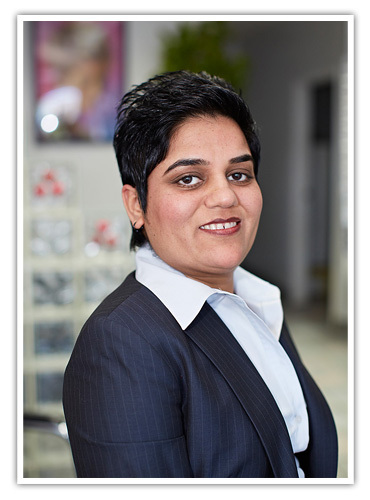 “Dedication to my customers is my number one priority”, says Pooja. That dedication to hard work is shown in her shop, her skills and in the satisfaction of her loyal clientele.